To tell the time you usually use a clock or a watch. There are analogue clocks and watches and there are digital clocks and watches. 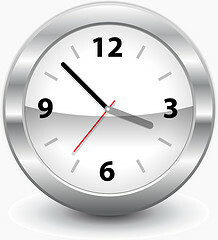 Analogue clocks and watches often have numbers on the "face" to show the hours and lines to show the minutes. An analogue clock also has "hands", a short hand to show the hour, a longer hand to show the minutes, and sometimes a long thin hand to show the seconds. Digital clocks and watches show the exact hours and minutes in numbers. They use 24 hours and sixty minutes to show the time. When talking about the time, to show whether it's morning or later we use am and pm. 12 o'clock is noon (daytime) or midnight (night). Test your time - match the pictures with the time - Match It! Read this song - Great for practising "the clock"